The record has already sold more than 400,000 copies in Europe and hit No. 1 in her home country. Judging by Selah Sue’s self-titled debut album, the Belgian singer-songwriter is a creative and sensitive musician who likes to explore different contemporary styles. The record has already sold more than 400,000 copies in Europe and hit No. 1 in her home country. The record is now being released in the United States. While Sue has talent, it seems unlikely that this release will make her a major star in America. Her persona is too vaguely defined. She lacks a distinct style and dabbles in several genres. That’s not necessarily a bad thing if one can override this through the force of one’s personality or other means. But is seems more likely that Sue will get only minor chart traction with this release. In this postmodern global smorgasbord, a musician can dabble in many forms looking for the right way to express oneself. One creates an identity through a musical bricolage. Indeed, this is how most listeners partake, putting the iPod on shuffle and going from say, M.I.A. one track to Melody Gardot the next. 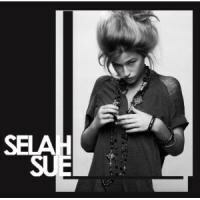 The problem on Selah Sue isn’t that, at times, one goes from hearing echoes of M.I.A. on one cut to the resonances of Gardot the next, it is that the music lacks a identifiable personality. The production compounds this problem. Several of the songs are densely layered with beats and rhythms that turn her voice into just another element. Sue does not stand out as much as coexist. On catchy songs, such as the bouncy riddims of “Crazy Sufferin’ Style” and “Ragamuffin”, Sue’s contributions seem minimal. The songs drip frills like sweat off of a stripper. Sue could be any body –anybody – vocalizing. Songs like these suggest that while Sue may be a dynamite live performer whose presence can center the focus of attention, her voice alone is not sufficient enough. Something is missing. The more personal songs, such as the acoustic “Mommy”, work best because Sue seems willing to put herself out there. So when she sings of love for her mother but still admits, “But I can live without you”, she surprises the listener by transforming the usual cliché. The same is true of the smoky jazz atmosphere of “Fade Away” in which she preaches the sensual over the spiritual as the way to enlightenment. Freeing one’s body will free one’s mind, Sue sings to a languorous accompaniment. The unique elements of these two tracks make them the most memorable on the album. There are other impressive moments on this disc. Sue shows promise, but right now her potential is more remarkable than what she has achieved. There is something infectious about her that shines through the weaker material. She has a rhythmic energy that suggests she needs to stretch out more than these dozen cuts of mostly three or four minutes allow. Sue needs to take more risks and stand out. Nobody could really hate this record, but one could easily just treat it as background noise. But I doubt many will really love this disc for the same reason.